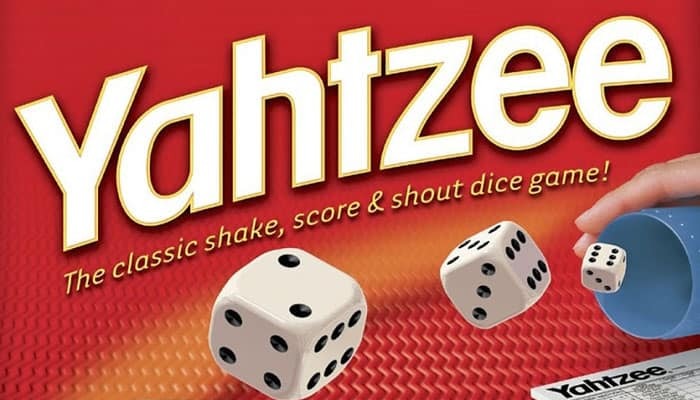 Yahtzee is a classic dice game based on Poker. It's played with 5 dice and your goal is to roll certain combinations to score points. Each turn, a player can roll the dice up to 3 times in hope of matching 1 of 13 combinations to score. A player can score each combination just once and it's not always possible. If you don't match anything, you have to fill in a zero somewhere. After the 1st and 2nd roll, the player can hold any subset of the five dice and roll the rest aiming to get the best combination. But after the 3rd roll, the player must find a place on the scorecard to put a score, even he didn't match anything good. You have to make wise choices when to score a combination and what combination you are targetting. lower section: three-of-a-kind, four-of-a-kind, full house, small straight, large straight, chance and Yahtzee (a five-of-a-kind). Bear in mind that some combos are easier to roll than others and you will (unless you’re a real dice shark) probably have to enter a zero at some point. 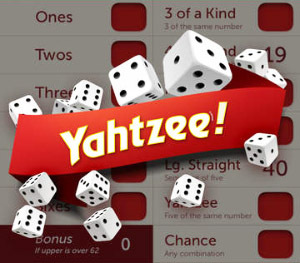 Scoring a Yahtzee can give you huge bonus, the chance to roll one is 1 in 22 attempts. When the upper section reaches a sum of 63 or higher, then you score 35 bonuspoints. Whell the scorecard is filled in (13 turns), the game is over and the total scores are calculated and the player with the highest score wins. 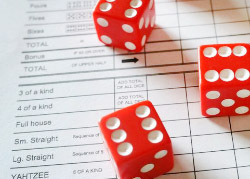 Because of the dice, luck plays an important role in Yahtzee but still your tactics will me a significant difference (just like with Poker). 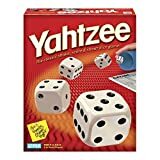 It's possible to play Yahtzee with any number of players and the average game takes about 30 minutes depending on how many players. The game is very portable and can be played everywhere, including a pub or an airport. 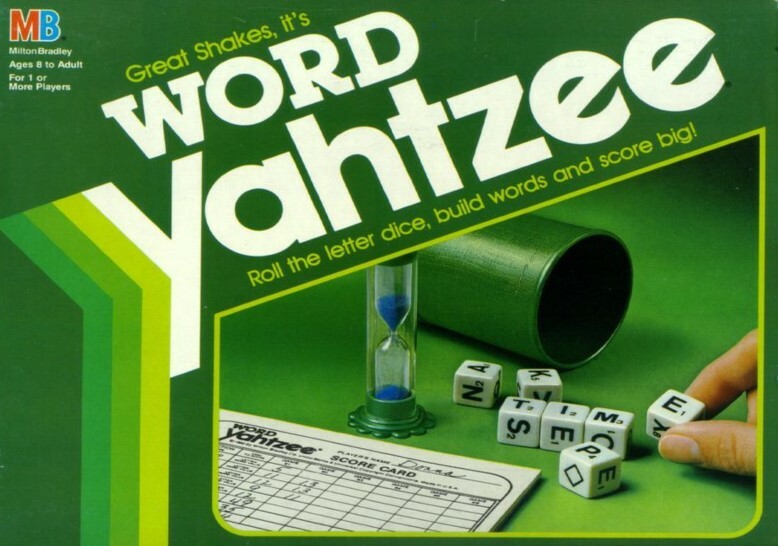 The game was created by a Canadian couple under the name "Yatzie" or "Yacht" in the early 1940. Edwin Lowe was the one who made the game popular and sold the rights to Miltom Bradley in 1973. 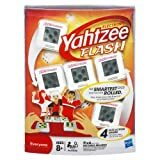 Still today, the game is still very popular as every year, Hasbro sells more than 50 million copies of Yahtzee every year. There exist also many variants to the game and all are fun to play. Roll a die to see who starts. Play continues clockwise. Write each player's name on the score card, in the order of play (pen not included). Roll dice to get the highest score after all 13 rounds. Roll up to 3 times each turn to rack up the best possible score. Decide which dice combo you're going for. 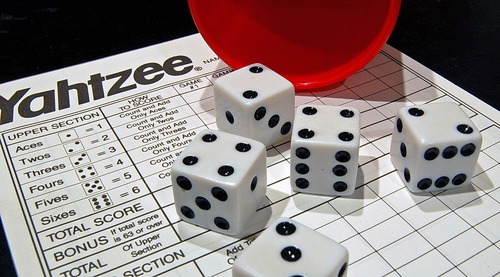 A large majority of the households all across the United States and quite a few in various other countries own their own set of the Yahtzee dice game. 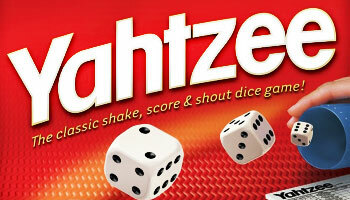 Word Yahtzee combines the joy of dart games with more intellectual stimulating parts of the brain. 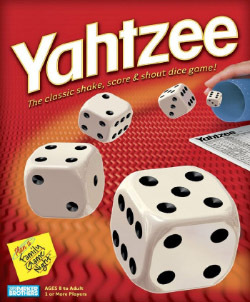 The dice for word Yahtzee have letters instead of numbers on them, which makes it like a cross between scrabble and regular Yahtzee or other dice games. This is a fun way to buff up you or your child's vocabulary and spelling skills.